Remember the good old days of hiring? Maybe you were the owner of a chain of franchises, or maybe you were a recruiter in charge of maintaining a workforce with a lot of turnover. You might recall posting an ad in the Classifieds, and awaiting the handful of job applicants to show up at your door. Ah, how simple it was yesteryear. Things are different today. It has never been tougher to make a good hire. Whether it’s the expensive job boards you have to post all over, or the new “on-demand” startups out of Silicon Valley you now have to compete against for the same applicants, your company must rethink how it hires to stay competitive. One of the biggest challenges of modern day workforce management lays in the top of the funnel itself: the increasing costs of hiring quality employees. While the number of total job openings in the world has increased drastically since the days of the Classifieds, the number of total job applicants has not. Not only is it costly to find someone to apply for your job opening, with a single Craigslist ad going for up to $75 a post, but it is also time-consuming to set up, meaning your recruiting process must be streamlined and fast to be cost effective. Instead of only focusing on new applicants, companies should look internally and improve their own hiring process. Your company should spend just as much time improving its hiring process as it should on attracting more applicants. In the past, you might have communicated with your job applicants purely in person, pen and paper in hand. You might have given them a phone call to coordinate interviews. Then the dawn of email arose and the expectation on how to communicate with candidates shifted to these electronic messages. Now that email and classifieds are old, rusty and filled with noisy spam, the most forward-thinking companies are making use of SMS channels to communicate with their job applicants. What was once seen as unprofessional is now the new normal. It’s the fastest way to engage with your applicants, and the most likely to elicit a response. We’ve seen show-rates for a booked interview skyrocket from an abysmal 25% to 75%, with companies using SMS as their primary means of applicant communication and reminders. Now this doesn’t mean each recruiter should individually be sending text messages through their own personal phones. While this works when you are small, it likely won’t work at a large scale. You want certain SMS reminders to automatically send to candidates without you typing each message, and even the personalized messages should be sent from a centralized dashboard so your team is up-to-date on the latest conversation and to prevent three different conversations from happening. 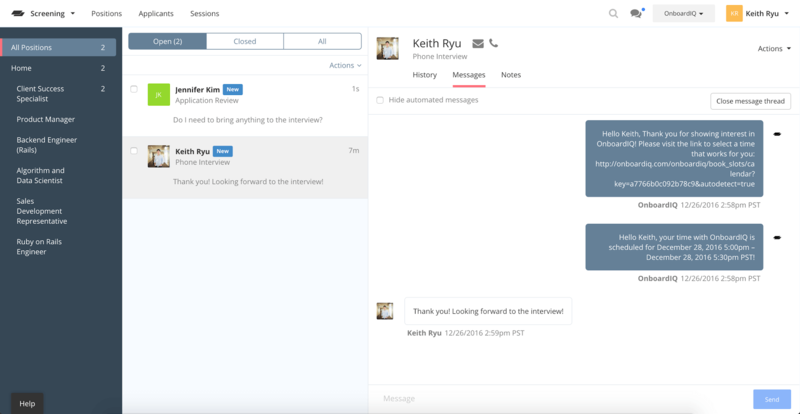 Luckily, you can leverage hiring automation software to manage your SMS communications with your applicants easily — and we just so happened to have built it! One of the biggest advantages newer companies have over their older counterparts is better technology. Mobile job applications is an ever-growing trend, despite a rather slow adoption from many companies. A recent survey reported that 70% of job searchers are looking for the ability to complete an application on mobile, but only about 25% of large corporations have implemented a mobile-optimized hiring process. Moreover, companies could lose out on talented applicants if their applications aren’t mobile-friendly — 20% of applicants surveyed said they’d give up on an application if it couldn’t be completed on a mobile device. A resounding 78% of applicants said they would use mobile to apply for jobs if the process were streamlined and easier. In the context of building and maintaining a workforce, mobile-based technology means two things: keeping the applicant experience purely paperless and mobile-optimized, and implementing a web-based applicant tracking system ASAP. No more storing paper documents or headaches with taxes each year. No more figuring out where an applicant is in your hiring pipeline by hand. No more time spent doing meaningless, manual work. Rather, you’ll get automatic document collection, management and applicant task assignment. This will shore up more time for you to actually do work, and leave your team member happier and more productive. Nobody likes to be left in the dark when it comes to a hiring decision, especially not when they have other job applications out in the wilderness. One thing that we’ve seen our customers make use of in our own product is automated updates. As soon as an applicant lands in a new stage, they use our “trigger messages” to send an email or SMS thanking them for completing the previous stage and informing them of what’s next. We also give our clients a beautiful, clean applicant portal. For applicants with a little more self-initiative, they can create a log in and track their progress in the hiring workflow there. We constantly hear applicants expressing gratitude for the professionalism and courteous updates that our customers offer via automated updates and the portal, as opposed to their experience applying for other companies. As a job applicant, there is nothing more frustrating than being told, “oh, I’m still waiting to hear back from X.” Whether X is a countersignature on a W9 or a manager’s opinion, it’s normally a bottleneck in the process. Applicants getting clogged up in the hiring process normally points to liability on the company’s end. Sure, some things like pending background checks are beyond your control. That said, it’s on your company to ensure that those checks are being run as soon as an applicant consents. We’ve seen that oftentimes the biggest reason for delay is due to a slow action time from the company’s side! Remember, a good applicant experience goes a long way! Moving your applicant to the next appropriate stage as soon as you can (our product automatically does this, thankfully) makes sure they are not waiting on you for anything. On the note of eliminating roadblocks in the hiring process, let’s examine how you run a background check today. Like most companies, your team likely moves an applicant into a stage where they are confident in paying for a background check. Then it gets tricky: you have to go to an external background check service provider, provide the applicant’s information, wait for them to send the consent form to the applicant, wait for the applicant to fill it out, and finally after all of these steps, you’ll get a response. What makes this such a pain is that this cumbersome process is the same for document signing, calendar scheduling, collecting additional information, and more. These tasks that take precious hours away from your team each day shouldn’t be done by hand — they should be automated! 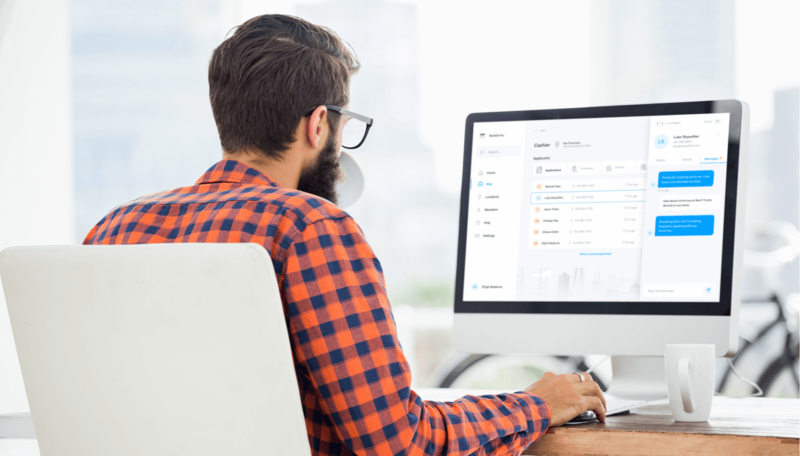 Many of our customers take advantage of our integrations with providers like HelloSign and DocuSign to automate their document signing, Checkr and Onfido to automate their background checking process, and more. This allows them to focus on other tasks that need to be done, free up their schedule to conduct more interviews and make faster decisions while these integrations run on autopilot. Applicants these days are notoriously unpredictable, whether it is not showing up to interviews, dropping off the radar for weeks at a time, or informing you of a change at a last minute. While there is no real solution to prevent applicants from evaluating other jobs (if we figured that out, we’d be billionaires by now! ), you can significantly help your chances of identifying a potential drop-off long before it happens or, better yet, prevent an applicant from dropping off altogether. The best way to keep your applicant drop-off rates low is to constantly but thoughtfully engage with your applicants. Consistently pinging your applicants whether it be via email, SMS or calling is a strategy that’s bound to bring even the least engaged applicants back into the fold. When possible, automate these engagements, but keep the human touch. Use dynamic merge keys that change with the applicant so that the messaging seems catered to the individual (i.e. name, city, etc.). When applicants do drop-off, you should either automatically or manually place them “on hold” in an email drip campaign — sending an email to them every few days or weeks. Many applicants come “back to life” in the future, and you won’t have to run through the whole hiring process all over again from the start if that’s the case. 7. Evaluate, learn, improve…and repeat! How do you collect data around your hiring process? Does your tracking platform allow for custom exports, field mapping and automatic data collection? Does it do so continuously and offer various levels of access to data on a secure cloud platform? Even after you have data to work with, how do you play with it? Do you have to play with massive spreadsheets and algorithms, or does your system intelligently and intuitively present data in a meaningful way? Finally, when you toy with the data enough, what insights can you generate from it? After all, data by itself is pretty useless. A chart without interpretation is meaningless. Ultimately, what we’re trying to do is to learn from what you’re doing today so that you can improve it in the future. Being smart with your data will enable you to learn from and improve your hiring process in the future. You might think it’s hard to find a quality worker these days, but imagine being an applicant having to apply to a dozen openings and managing multiple interviews at the same time. We’ve found that our clients who are accommodating and understanding of the difficulties of the application process are the ones who have the most successful conversion rate. Instead of rushing an applicant and blaming them for being slow, data shows that using positive, encouraging messages in a continuous, friendly way can increase conversions up to 21% in a single stage of the hiring process. Being an applicant isn’t easy. Kind words go a long way. Hopefully you found these tips helpful, and we wish you the best of luck with hiring in these fast and uncertain times. Of course, if you’d like to check out what we’re building and see if it might be able to help you supercharge your hiring process, you can always request a demo for free from one of our friendly team members! OnboardIQ works with your existing HR software to automate and optimize manual tasks like scheduling interviews, running background checks, and more.